Hortus Camdenensis | Gaillardia aristata Pursh. Fully hardy erect but often spreading perennial with yellow flowers, the ray florets sometimes tinged red at the base, and orange red discs, in summer. To 75cm. [RHSE, Hortus]. 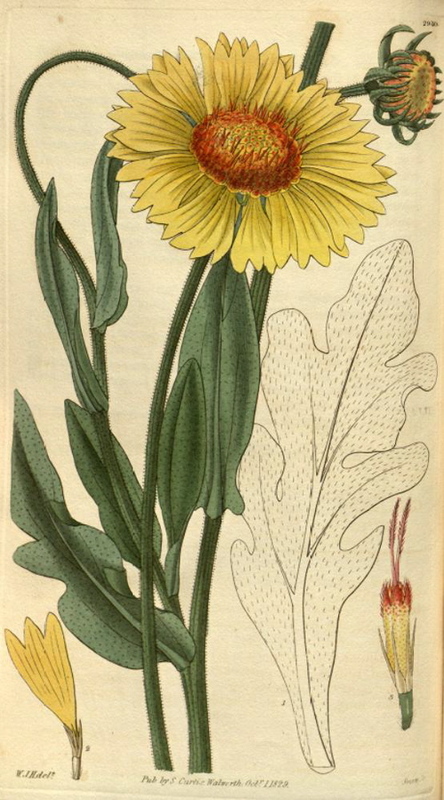 ‘The principal difference between this and the G. bicolor of our gardens, consists in the leaves being entire in the upper part of the stem, and in the ray of the flower being of one pale, uniform, yellow colour. Pursh described it from the Herbarium of Lewis, who found it in the Rocky Mountains, on dry hills. Mr. Douglas discovered it abundantly in dry soils, through a tract of country extending from the Rocky Mountains, to the Western ocean; every where retaining the characters above mentioned, which distinguish it from the G. bicolor. It varies in size : for intermixed with the common appearance of the plant, Mr. Douglas saw many which did not arrive to a height greater than ten or twelve inches, and having all the leaves entire.’ Will soon become common: the seeds having been introduced by the Horticultural Society, and by them liberally dispersed among our gardens.’ [BM t.2940/1829]. ‘A handsome hardy perennial, found in the north-west of North America by Mr. David Douglas, and by him sent, in 1827, to the Horticultural Society, in whose Garden at Chiswick our drawing was made in July last. […] It is, no doubt, the G. aristata of Pursh, which Mr. Nuttall considers a mere variety of G. bicolor. It appears to us, however, to be sufficiently distinct as a species, especially as it does not lose its wild features when cultivated.’ [BR f.1186/1828]. The Illustration Horticole figures Gaillardia grandiflora, a hybrid between G. aristata and G. picta [pulchella], and very similar to modern strains of G. x grandiflora. [IH p.139, vol.4/1857]. Listed in the 1850 and 1857 catalogues [H.104/1850]. Gaillardia bicolor Lam. var. aristata (Pursh) Nutt.